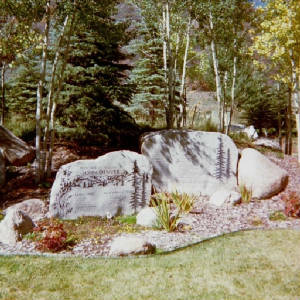 One of my most memorable experiences from my visist to Aspen in 2002 was the Sunday morning service at the Snowmass Chapel. After the traditional service inside we all went outside for the dedication ceremony for the memorial garden. The highlight of this ceremony for me happened during Mack Bailey's performance of 'Potter's Wheel'. An eagle had been flying overhead for sometime. Then, at the end of the song a flight of doves was released and they soared above us with the eagle still circling above them. It was such a beautiful sight and I was reminded of the columbine, - Why, well the name columbine means 'like a dove' , while the latin name for the flower, aquilega derives from the word for eagle. I find it so symblic that this flower should be the state flower of Colorado. 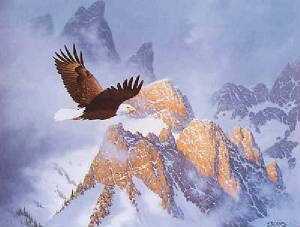 The home state of John Denver who so loved eagles and so longed for peace, of which the dove is a symbol. I wonder if he knew. In Christian tradition the dove is a symbol of the Holy Spirit. I was reminded of this last December 31st., when my husband and I decided to celebrate John's birthday by driving to the Black Moountains in South Wales which are just a few miles away from us. We went up a beautiful, favourite valley of ours and stopped at a place called Llanthony Abbey. There is a little church there that I had never been in before. This time I did go inside and saw a beautiful window depicting a dove representing the holy spirit. I wish I had had my camera but will take it next time. The colours of blue and green and white were so lovely. 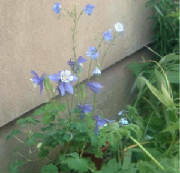 Because of its connection to the dove the columbine has been used in religious art also as representing the Holy Spirit. The eagle, too has spiritual connections. I found this on the 'Eagle Spirit' webpage. I didn't know all of this when I saw an eagle and a flight of doves together in the sky above Snowmass Chapel. Click on the eagle to go to the 'Eagle Spirit' webpage. It's fascinating. On these columbine it can be seen how the white petals resemble a dove's fan tail. in a meadow of columbine. And all that we can be not just what we are.